I love M&M cookies! My kids love M&M cookies! My husband loves M&M cookies! So I decided to make M&M cookies today! I recently bought the pastel Easter M&M’s and realized I had accumulated 4 bags! 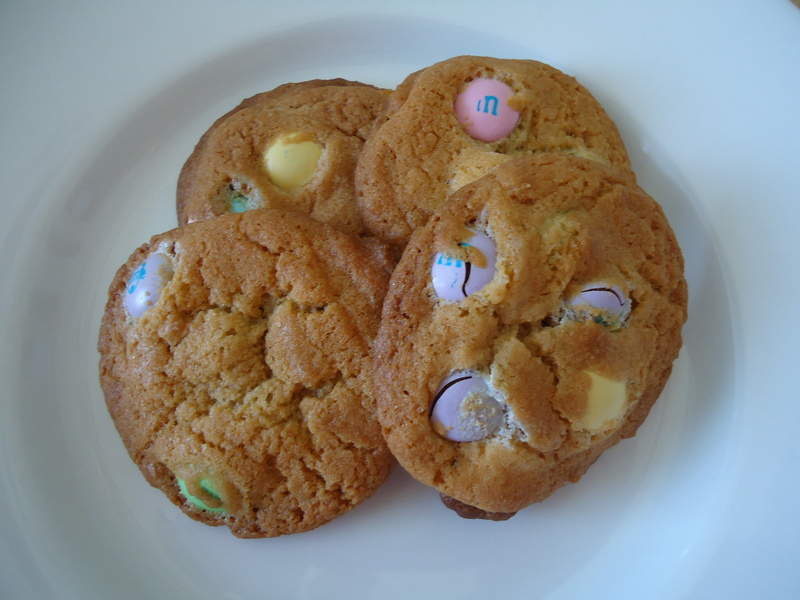 So, we now have M&M cookies just in time for Easter. M&M cookies remind me of my childhood. My Mom made them often and now I make them for my kids. They are just as I remember and now that they make them in different colors I can get creative and so can you! You can buy all sorts of individual colors to suit your organizations colors or school colors. I like the packages you can buy now with Christmas colors and Easter colors. Maybe some day they will sell packages of red, white and blue for July 4th! In a medium bowl sift together flour, baking soda and salt. In the bowl of a stand mixer, blend Crisco and sugars together until combined. Beat in vanilla, water and eggs. Add flour mixture to the sugar and egg mixture and mix well. Stir in M & M’s. Drop by teaspoon, or use small ice cream scoop, onto parchment lined rimmed baking sheet. Bake at 375 degrees F. for 8 to 10 minutes or until golden. For additional color, press additional M & M’s into cookies before baking. This entry was posted in Cookies, Easter, Favorite Things, Holidays, Kid's Favorites. Bookmark the permalink.